Our latest post from the Kentucky Forager! 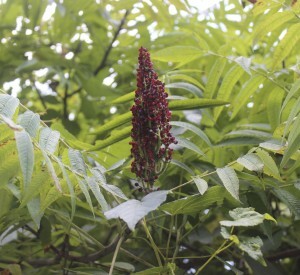 Smooth sumac (Rhus glabra) is one of the most common roadside trees in Kentucky. Considered a nuisance by most, this incredibly prolific plant is easy to spot and can be found nearly everywhere. Sumac tends to get a bad rap for a number of reasons, but you might be surprised to find that smooth sumac is just one of many edible varieties of sumac. Let’s do some word association. What is the first word that comes to mind when I say “sumac”? If so, you are not alone. Poison sumac (Toxicodendron vernix) is the only sumac that most people are familiar with, but if you are worried about confusing smooth sumac with poison sumac, don’t fear. Poison sumac does not have red berries like the edible sumac varieties, and it is not common in Kentucky. In fact, it is so rare you will likely never see it at all, even if you are looking for it. It prefers wet soil and is almost exclusively found in the middle of swamps. Poison sumac will have white or green hanging berries. I’ve personally never seen poison sumac, but it’s good information to know just in case you ever have the misfortune of coming in contact with one. Another word of caution, sumac is in the anacardiaceae family, commonly known as the cashew family. So if you are allergic to cashews, mangoes, or pistachios, you should not ingest sumac. Begin to look for smooth sumac in mid July. The cone shaped clusters of red, velvety berries are a dead giveaway. Late July through early August is the optimum time to harvest it’s fruit. Taste a berry before harvesting. If it’s bitter, you are too early, if it’s bland, you’re too late. The berries should be extremely tart, like a lemon. The berries are not good to eat, as they are mostly seed, but they are excellent for making a lemonade type drink. 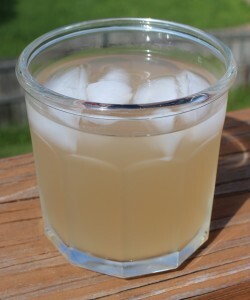 Sumac-ade, or Indian lemonade as it’s often called, is a delicious, nutritious, and refreshing summer drink. The Native Americans have been using sumac for centuries. They not only used it for flavoring food and drinks, but also used the leaves for tanning leather and adding to their pipe tobacco. 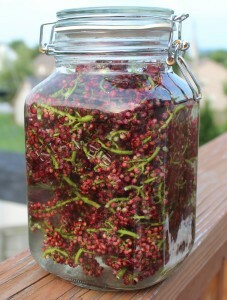 To make sumac-ade, gather several berry clusters from a clean source. Sumac loves roadsides, and roadsides tend to be polluted. Look for trees that aren’t too close to any heavily traveled roads, and look for signs of herbicide poisoning. Do not gather them right after a rain, and do not wash them. Most of the flavor is in the velvety outer layer and is washed off easily. Carefully inspect the clusters for bugs. (Some people leave the clusters whole, I personally like to pull them apart to thoroughly inspect them.) You will likely find a few stowaways. Some people are not bothered by a few creepy crawlies…I am not one of those people. Place the berries in a pitcher or jar, and cover with water. Do not use hot or boiling water! It will leach the tannic acid from the stems and seeds, and make it very bitter. Crush the berries a little using a wooden spoon, potato masher, etc. Cover and let steep overnight in a cool place. 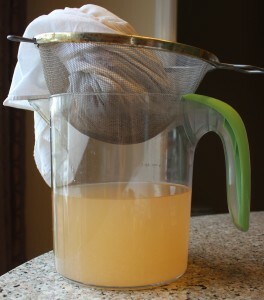 After the berries are done steeping, give it another quick mash, strain through a cheese cloth, and sweeten to your taste. It’s the perfect recipe for the beginner forager. Easy to find, easy to harvest, and easy to make. Oh, and did I mention it’s DELICIOUS?! 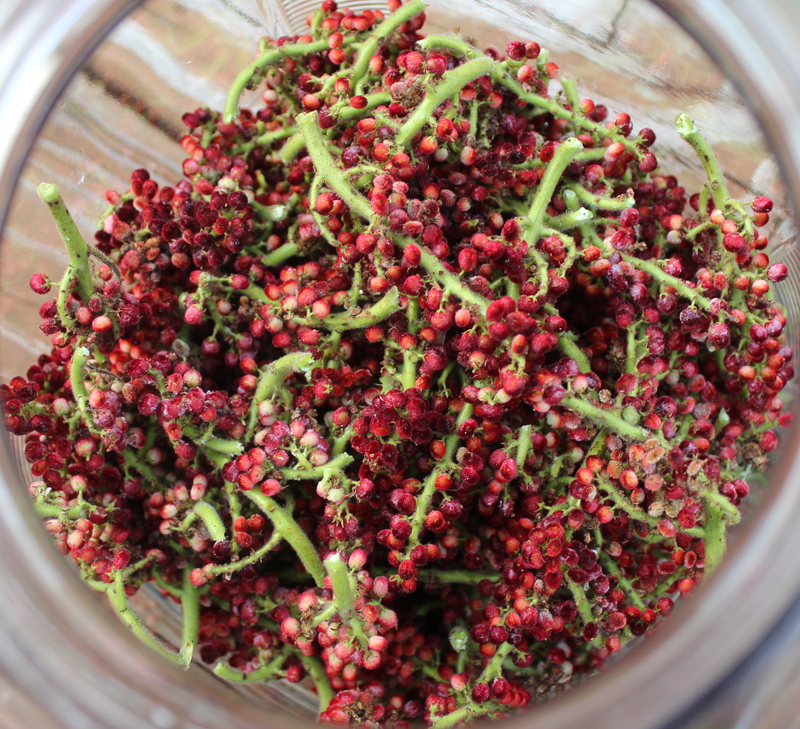 Like lemonade, it’s tart, refreshing, and a great source of vitamin C.
Sumac berries can also be used to make wine or jelly, and they can be dried and stored for future use. Pingback: THIS & THAT. » Rough Draft Farmstead. I never knew of sumac in KY but the place we bought in AL was loaded with the bushes; I’ve been making the lemonade for years but just this year learned of using it to make pie with; delish!